Because of this blender's overall ranking of 82%, we are confident that the Hamilton Beach 58870 Quiet is currently Alphachooser's best Hamilton Beach blender 2019. Furthermore, we think that our 83 reviews sampled from our sources give us a high confidence level (more on confidence levels) that justifies making it a "no-brainer best choice." Because of star rating of 4 derived from 57 reviews, here is what we consider second best Hamilton Beach blender. * This list, by the way, is based on an in-depth aggregation of hundreds of reviews from around the web. A two-speed hand baby blender with a stainless steel BPA-free blending wand. Compact and basic 14-ounce 175-watt smoothie blender with a BPA-free jar that turns into a travel cup. A blender-and-chopper unit that has four pre-programmed settings: mix, puree, dice, and grind, as well as two pulse speed settings. Silver-toned 40-ounce blender with fourteen speed settings, a blending system that draws down food to its ice-crusher blade, and a three-year warranty. Uniquely-spouted 40-ounce 700-watt blender with a blending system that draws food down to its patented ice-crushing blade, a four-speed setting, and a noteworthy three-year warranty. Case-hardened 40-ounce blender with a Wave Action system that promises no more stirring, four speed settings, and three years of warranty. 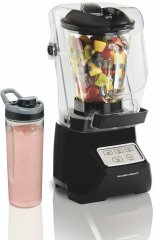 Low-priced 700-watt 56-ounce blender with ten speed settings, a wave action system developed to make chunk-free smoothies, and a three-year warranty. Classic blender that features several preset programs such as mix, puree, grind, dice to cover a mix of food-preparation and blending tasks. A bar blender that targets functionality and speed with its two speed settings (high and low), which Hamilton Beach says will need just 25 seconds to blend a 16-ounce drink.